I believe in the power and relevance of multimodal composition and storytelling for today’s children and teens. My belief is not abstract – it comes from my work with students on different types of multimedia projects. I also enjoy experimenting with my own multimodal pieces, especially integrating text and images. However, I remain a novice in this arena, never losing the feeling that there is so much that I don’t know that could potentially be helpful to me, and to my students. Thus, I love it when I find help from those who are expert at what they do! In this case, it is the reporters and staff from CNN.com who are sharing their expertise. 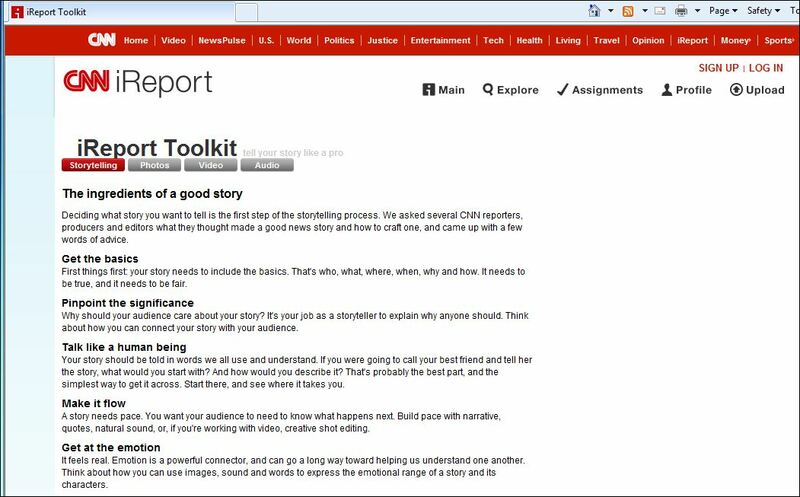 As part of their participatory news initiative, CNN has developed an iReport Toolkit that is available online at http://ireport.cnn.com/toolkit.jspa. The goal of the toolkit is to help you “Tell your story like a pro”. Of course, for CNN, stories represent all kinds of genres – from the investigative news expose to the human interest story. The toolkit includes four main sections, Storytelling, Photos, Video, and Audio. These expert reporters and storytellers start with Storytelling — highlighting the ingredients of a good story and then offering key advice such as getting the basics first, attending to pace, and talking like a human being (that is my personal favorite!). Additional links expand on different aspects of storytelling, allowing you to pursue your own storytelling needs and interests. For each of the next three sections – photos, video, and sound – the CNN folks zero in on what is unique about that mode for storytelling and communication purposes. The storytelling guidance is integrally connected to technical advice, such as framing your shot, or audio recording in a place with a noisy background. I especially enjoy the pieces that feature advice specific reporters and production staff. While researching for this blog, I found a piece, ‘Editing Video like a Pro’, by reporter/producer Brandon Ancil (http://www.cnn.com/2011/IREPORT/09/09/edit.video.bootcamp.irpt/). It caught my eye because I’m preparing to create a mini-documentary about two youth composing a digital story together. This is a new experience for me, so I’m eager to try out Ancil’s method for organizing his video during editing and production. I will let you know how it goes in a future post! This type of resource can be used at two levels – to support your own experimentation with multimodal composition and to support your teaching efforts. If you are teaching middle or high school students, your students will be able to read and use the site on their own, with your guidance as to which sections to attend to for their particular project. If your students are younger, much of the information is applicable, but you will need to apply it as appropriate for your students. Try it and see! And, please share strategies and resources that you have found to be particularly helpful in teaching multimodal composition to your students.